Image credit: E. Dennis Seymour, Distant Rocks, 2017, hand ground ochre, 105 x 72 cm. Collection of the artist. Image credit: E. Dennis Seymour, North Country, 2016, hand ground ochre, 126 x 66 cm. Collection of the artist. Uncle Edward Dennis Seymour’s works embrace and describe a compelling love of his mother country. Since taking on university studies in his 80’s, Uncle Dennis has further developed his approach to the ancient cultural art form of using ochre. To create the ochre, Uncle Dennis takes the rocks of his mother country, grinding them to a fine dust. He then strains and mixes the dust with water, before laying them out to dry to a soft powder. These powders are then mixed with small portions of water and used to paint celebrations of country. 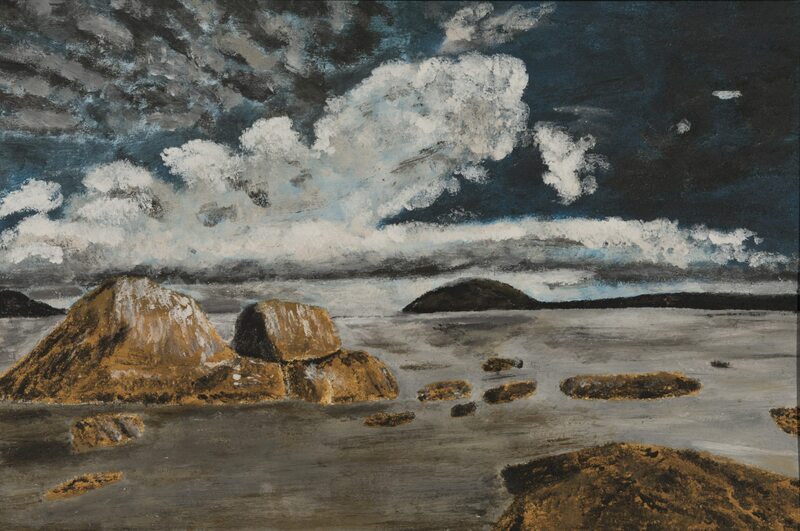 Each ochre-laden brush stroke builds a textured picture, a style of creating indicative of Seymour’s personal history. The images depicted in Paint Country With Country reflect Seymour’s memories and experiences of country, specifically in South Australia. Painting enables Seymour to feel at one with his mother country, to connect and communicate; whilst recognising the success that can come with embracing life and culture. Uncle Dennis’s journey in life continues, as does his art; Paint Country With Country reflects the changes of self he has experienced over his lifetime.